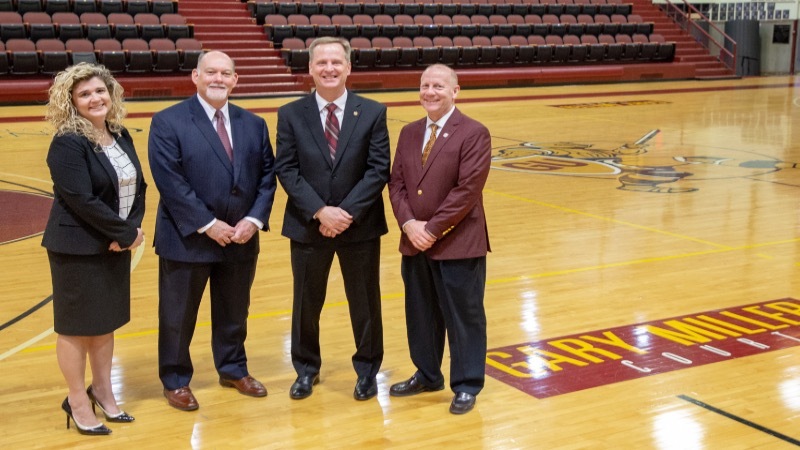 ERIE, Pa. — Gannon University has named Cleve Wright as its next head women's basketball coach. The announcement was made Friday morning during a press conference held in the Boardroom of Gannon's Old Main. One of Gannon's all-time winningest basketball coaches, Wright returns as the Lady Knights embark on their 47th season. A coaching veteran of nearly three decades at both the NCAA Division I and II levels, Wright served as the Gannon women's basketball head coach from 2002-13, before serving as the head coach at NCAA Division I Miami (Ohio) from 2013-17 and as an associate head coach at NCAA Division I Eastern Illinois last season. "I am extremely excited and grateful to return to Gannon University as the head women's basketball coach," Wright said. "Gannon and Erie are home for me and my family. I want to thank President Keith Taylor, Vice President of Student Development and Engagement Brian Nichols, and Director of Athletics Lisa Goddard McGuirk for this opportunity to once again lead one of the top women's basketball programs in the country. I look forward to working with the student-athletes and serving this respected University and the Erie community." Wright departed Gannon in April 2013 as the school's all-time winningest basketball coach regardless of gender at the time. He produced a 233-100 career record in 11 seasons at Gannon, resulting in a .700 winning percentage. His victory total is 128 more than any other women's basketball coach in school history. "We are excited to welcome a familiar face back to Gannon University and the Erie community," said Goddard McGuirk. "As a University and as a Department, we strive for excellence athletically, academically and in the community. Coach Wright's resume speaks for itself. He has led Gannon women's basketball teams to conference championships, NCAA regional titles and NCAA Elite Eight appearances. His student-athletes have always achieved success in the classroom and within the community. We are confident that our women's basketball program will continue its tradition of excellence under the leadership of Coach Wright." Wright took the Gannon women's basketball program to heights unseen in school history. Prior to his arrival, Gannon had qualified for the NCAA Tournament four times in 28 seasons and had won only one NCAA postseason game during those trips. During Wright's tenure, the Lady Knights played in five NCAA Tournaments and won 11 NCAA postseason contests. The run included a trip to the NCAA Division II national semifinals in 2010 and NCAA Division II Elite Eight in 2013. Individually, Gannon student-athletes earned All-America honors six times and all-conference accolades 28 times under Wright. Wright's coaching awards are plentiful. He was named NCAA Division II National Coach of the Year and Atlantic Region Coach of the Year by the Women's Basketball Coaches Association (WBCA) in 2010. A three-time conference coach of the year, Wright was named Pennsylvania State Athletic Conference (PSAC) Western Division Coach of the Year twice in 2010 and 2013. In addition, he was named 2007 Great Lakes Intercollegiate Athletic Conference (GLIAC) Coach of the Year. The accomplishments off the court were stunning. In addition to producing the best team grade point average in the PSAC during the 2011-12 season, Gannon was among the nation's top 25 in team GPA during seven of his final eight years. The run included a No. 12 ranking in 2008-09 (3.497) and 2009-10 (3.491). In 2006-07, the Lady Knights achieved their highest national ranking ever, being tabbed sixth with a 3.494 mark. The program was 14th in 2011-12 (3.526), ninth in 2007-08 (3.508), 21st in 2005-06 (3.343) and seventh in 2004-05 (3.487). In addition, Lady Knights earned conference all-academic honors 70 times during his last 10 seasons. The Gannon women's basketball program was extremely mindful of its responsibility to the community during Wright's time at Gannon. The Lady Knights were honored as the Outstanding Young Philanthropist by the American Fundraising Professionals (AFP) in 2011. The program began its annual Pink Zone event to help local cancer survivors in their fight against cancer in 2008. The Lady Knights raised nearly $100,000 that stayed completely local as a result of the Pink Zone event. Wright not only established himself as one of Gannon's all-time best, but also as one of the top head coaches in NCAA Division II. Prior to accepting the head coaching position at Miami (Ohio), he ranked 21st among active Division II coaches and first among PSAC coaches in career winning percentage. That mark ranks 33rd all-time in NCAA Division II women's basketball history. In 2009-10, Wright produced the most successful season in the history of the women's basketball program. The Lady Knights advanced to the NCAA Division II Final Four for the first time in school history. The squad broke the NCAA Division II record at the time for most victories (37) in a season and still holds the record for most consecutive wins (37) in a single season. Along the way, the program won its first-ever PSAC Championship and first-ever NCAA Division II Atlantic Regional before a sold-out crowd at the Hammermill Center. The Lady Knights finished No. 2 in the final USA Today ESPN Division II Top 25 Coaches Poll. One of the traits of a successful coach is their ability to get teams to play well down the stretch. And the Lady Knights did just that with Wright on the sidelines, winning 72 percent (83-33) of their games in the months of February and March. Gannon concluded the 2012-13 campaign with a 31-5 record, representing the second-most victories in school history. The Lady Knights won the PSAC Western Division regular-season and the NCAA Division II Atlantic Regional titles en route to the program's second NCAA Division II Elite Eight appearance in the span of four seasons. The season eventually came to an end against Ashland in the national quarterfinals, marking Gannon's third straight NCAA Tournament appearance that ended with a loss against the eventual national champion. The Lady Knights began the 2012-13 season by defeating NCAA Division I programs Kent State and the University of Buffalo in exhibition games. The final USA Today Sports Division II Coaches Poll placed the Lady Knights sixth nationally. Gannon was nationally ranked in 27 consecutive polls and received votes in the national poll at some point during each of Wright's final seven seasons. After his successful run at Gannon, Wright spent four campaigns as the head coach at Miami (Ohio). The academic excellence continued as the Redhawks ranked sixth among all NCAA Division I programs in team grade point average in 2017. In addition, 15 student-athletes were named scholar-athletes during his tenure. His philanthropic leadership continued as the Miami (Ohio) program raised over $50,000 from 2014-17 in the LOVE HONOR CARE game donating funds to a local charity Luna Cares to provide for the needs of local cancer survivors. At Eastern Illinois University, another $25,000 was raised from 2018-19 in the CARE game with funds donated to the Sara Bush Lincoln Cancer Center to provide for local cancer survivor's needs. Wright has 33 years of coaching experience, including three seasons (1999-02) as the top assistant at Division I Northwestern University, located in Evanston, Ill., and a member of the Big 10 Conference. At Northwestern, Wright was responsible for the development of the post players and was the program's recruiting coordinator. The All-Star Girls Report ranked Northwestern's 2001 recruiting class as the 35th-best in Division I. In addition, the Women's Basketball Journal named Wright one of the top 25 assistant coaches in Division I during the fall of 2002. From 1997-99, he was an assistant coach in the Horizon League at Division I Butler University. He then moved to Northwestern in 1999 after Butler coach June Olkowski resigned and accepted the head coaching job for the Wildcats. Prior to coaching at Butler, Wright spent four seasons as the head girls' basketball coach at Southwestern High School in Somerset, Ky. At Southwestern, Wright earned Commonwealth Coach of the Year honors and 48th District Coach of the Year accolades in 1997. Wright received a Bachelor of Arts degree in 1989 from Berea College in Berea, Ky. While in college, Wright was a two-sport athlete, competing in both basketball and track. As a student at Berea, he served as an assistant coach for the women's basketball team after competing with the men's team for one year. From there, Wright moved on to a graduate assistantship at Ball State from 1990-92, where he also received a Master of Arts degree in athletics administration. Prior to his coaching stint at Southwestern High School, he served as an assistant at Duke (1992-93) before joining Olkowski at Butler University. Wright has been published twice in Coaching Women's Basketball magazine. His articles "Developing Role Models Today" and "Out of Bounds-Baseline" were published in 1995 and 1996. Wright has also been affiliated with the Women's Basketball Coaches Association, serving as the NCAA Division II Representative on the WBCA Board of Directors. He and his wife, Diane, have two daughters, Chloe (22) and current Grand Valley State women's basketball student-athlete Emma (20).